Gem Panic is the consolation prize for the aborted 'Gem-Candy'  competition. 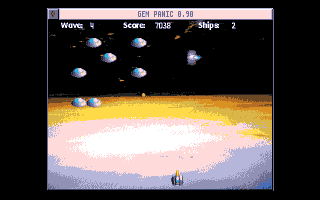 revenge to an earlier Breakout style game for Gem called 'AstroPanic'. towards you at the bottom of the screen. your  targets reasonably often,  this has a favourable effect on the  score. score being subtracted from by 10%! is described as a 256 colour game, and I can't quibble with that. Now screw your eyes up, and try double the screen resolution! got to the higher, more activity-dense levels! you can plan your attack and evasion in these conditions more  deliberately. spot the insanely quick blur that kills you, or possibly not? through to a range of sampled effects on either Xbios or GEMimg sub-systems. battle-hardened contender in the kill-em-up stakes..
Graphics:- 75% - Good looking for Gem, up to 256 colours onscreen. Sound:- 65% - Functional and to the point. Playability:- 70% - Generally good, but there's a nasty slowdown later. Overall:- 75% - With all its little flaws, it still hits the spot. CiH, for Alive! Mag,Jan '05..